Originally published in the Yellow Springs News on March 30, 2017. The Orbit Family Fun Center in Huber Heights features a skating rink of the classic variety, with neon paint on the walls and a snack bar, but the skating going down on the hardwood last week was anything but. Skaters were bedecked in helmets and pads and bore fearsome eponyms like “Peppermint Splatty” and “Beast Mode.” Skaters battled furiously around the rink while a bevy of officials scrutinized the rough ’n’ tumble ballet going on before them. Hip-to-hip contact sent players crashing to the ground, more often than not spinning once or twice as they bounced out of bounds. But they quickly picked themselves back up, vying to break ahead of the pack or be part of the human forcefield that prevented others from doing the same. The score quickly ran to 23–5, a clear indication of the intensity of competition. It was just another pulse-pounding match between teams of the Gem City Roller Derby, an area derby league that boasts a significant Yellow Springs presence. The match was between the Murder Squad and the Bullyfrogs, and it was the last game of the intra-league season. The game was serious, as the winner would be the Home League Champion. Villagers Rose Pelzl and Jacqui Creepingbear played in the most recent bout, with Jessica Martinez there selling merchandise, as her team Snark Attack was not competing that evening. Pelzl and Martinez just completed their freshman season as derby players, and Creepingbear her second. Villagers Oni Garrett, Madi Golden, Jonny No and Katrina Eresman are also part of the Gem City league. The sport appeals to the players for individual reasons, but there is a universal appeal as well: it’s simply fun to skate fast and flex muscle as part of a team. Intimidating indeed, as a derby match is at first hard to follow. Gameplay occurs in tight human knots, as each team plays offense and defense simultaneously, and it is quite possible to score five or more points at a time. But there’s a method to the madness, with each skater playing her part in a carefully orchestrated routine. Each team has five players. Four players are blockers while one player — the jammer, who has a star on her helmet — tries to score. Scoring occurs when the jammer breaks ahead of the pack, goes all the way around the track and laps players on the opposing team. Each player she laps before getting stopped equals one point. 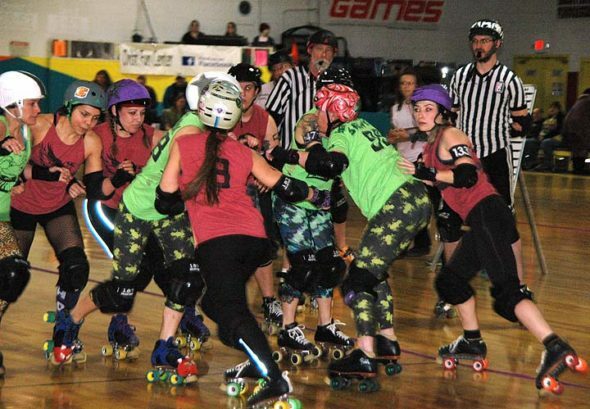 The jammer’s teammates try to make a path for her by keeping opponents out of the way. Meanwhile, the other team is trying to do the same thing — getting its jammer ahead while stopping their opponent’s. Gem City has an all-star team that travels to other cities and plays their premier teams, but it also has three teams (Bullyfrogs, Murder Squad and Snark Attack) that play each other. The intra-league play gives players of all skill levels a chance to play, Creepingbear said. Provided a player can pass a few benchmarks, such as skating 27 laps in five minutes and jumping laterally 18 inches, she can be part of the team. Pelzl recently passed the last of her preliminary tests and was a stalwart player in the match against Murder Squad. She became interested in roller derby after helping to film last year’s derby finals in Columbus. While never interested in sports before, she said, within 10 minutes of seeing her first match, she wanted to play. She signed up to be part of Gem City in May alongside Martinez. Roller derby was much harder than she’d imagined — “the people I watched had been doing it for years,” she realized — but she was moved by how encouraging an environment it was and quickly became a devotee. Martinez also started with little experience, realizing that she had no problem skating but did have a hard time stopping. But she too took to the rigorous practice schedule, passed her tests and earned herself a position on Snark Attack. She likes blocking a lot, she said, as it works better with her skill set, but she is getting used to the quick movement necessary to be a jammer. For many of the players, roller derby offers not only a chance of athletic release but a community of friends that extends beyond the wood of the rink. Players come from Kentucky, Xenia, Piqua and Indiana, said Snark Attack team member Whitney Baker, aka “Miss Demeanor,” and are in careers ranging from librarians to engineers to nurses. Creepingbear comes from a rugby background while other players used to figure skate. At last week’s match, there were two mother-daughter combinations playing, she said, and book clubs and other social events have formed thanks to players meeting at the derby. Pelzl’s mother, Corinne, frequently skates and practices with the team as well. The league has also attracted area fans interested in acting as officials. Yellow Springs resident Martin Borchers paced the middle of the rink as a non-skating official in last week’s game, whistle in mouth as he jotted down statistics. He was tasked specifically with “line tracking,” which involves recording the positions of each play and the people involved. His stats were recorded on a large whiteboard in the center of the rink. Borchers got involved after tagging along with his best friend Creepingbear to a match. He’d had some familiarity with the sport but it wasn’t until he saw it up close and personal that he really appreciated the nuanced rules and strategies. “They’ve really put together a well-planned game,” he said. He officiated for the first time in September 2016 and numerous practice runs at scrimmages and non-league play. Back on the rink, Murder Squad was down 17 points with 13 minutes left in the game. But given the possibility of multi-point scoring, this wasn’t an insurmountable lead. The stakes increased as the game neared its end: one member was given a two-minute penalty for misconduct in the form of talking back to a referee, but with 30 seconds left, the Bullyfrogs were up 166–150 and it seemed clear they would secure the win. An official review of a play did a little to keep hope alive, but the timer continued its inexorable countdown until it chimed its final chime, the sound of naught but victory for the Bullyfrogs. The final score was 174–154, awarding the Bullyfrogs the home league championship and a season record of 5–1. The team — including Pelzl and Creepingbear, or rather Peggy Screw and Action Jax — took a victory lap and high-fived their fans. Creepingbear was declared the team’s MVP, no small accomplishment for a player who has only two seasons under her belt. A small contingent of Yellow Springs fans had been cheering on their friends for the duration of the game. Pelzl hopes that the empowering nature of the sport and the established local connection will draw more players, fans and officials from the village. The action and the special camaraderie of the derby is something every player from Yellow Springs and beyond is looking forward to. For those that have surged with derby-inspired adrenalin and felt the sting of wood on flesh, the next season can’t come soon enough.